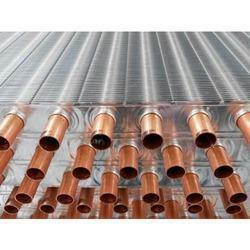 Leading Manufacturer of cooling coils from Coimbatore. We are the best known in the market that are engaged manufacturing, retailing and wholesaling Cooling Coils. We serve our clients efficiently with premium products that are high on quality value and services that are prompt and reliable. We also make sure to attend the customized needs of the customers with the exact incorporation of specifications and drawings. Assisted by our diligent team who uses quality raw material, we construct these in various configurations. Looking for Cooling Coils ?